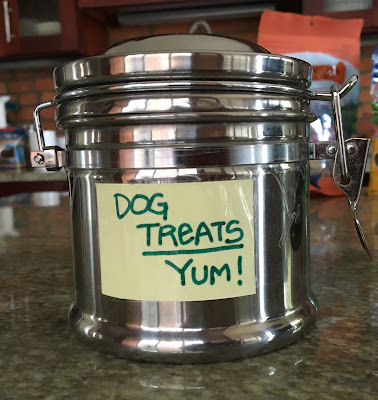 DIY Dog Treat Jar With Nutritious #NaturalBalance Treats! 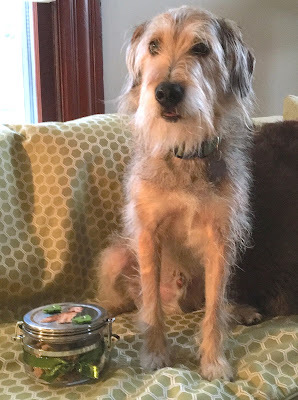 Let's get this out of the way right up front: Parental Unit is NOT crafty, but even she enjoys embellishing a treat jar (or two) and filling them with a variety of healthy Natural Balance® treats. 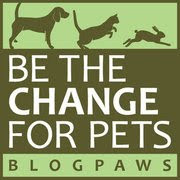 This post is sponsored by Natural Balance and the BlogPaws Professional Pet Blogger Network. 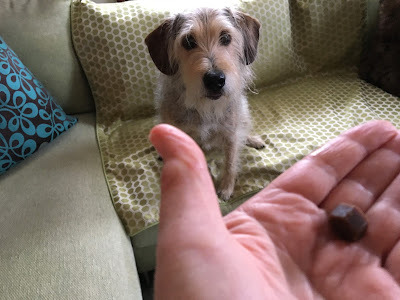 I am being compensated for helping spread the word about Natural Balance Wild PursuitTM or Natural Balance Treats, but Bocci's Beefs only shares information we feel is relevant to our readers. Natural Balance is not responsible for the content of this article. It's also important for all of you to know that I have trained Parental Unit and all of her friends to regularly give me treats. For example, when I come in from playing in our yard, I sit nicely and lift my paws for wiping. I've got four paws so that should add up to four treats..., but I usually only get one small one—what's up with that? But I digress. 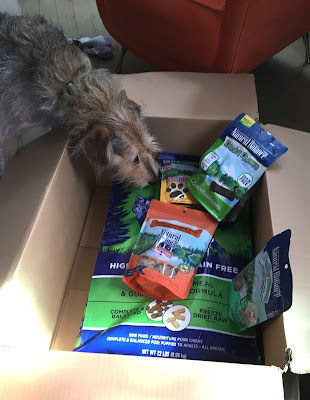 What's really important to both Parental Unit and me is that every treat I eat is healthy and provides high quality nutrition. 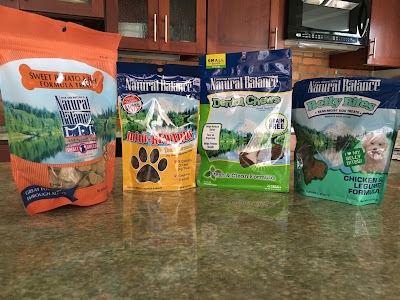 These Natural Balance dog treats (they have plenty of treats for cats, too), contain premium-quality proteins and are backed by the Natural Balance Buy with Confidence guarantee. 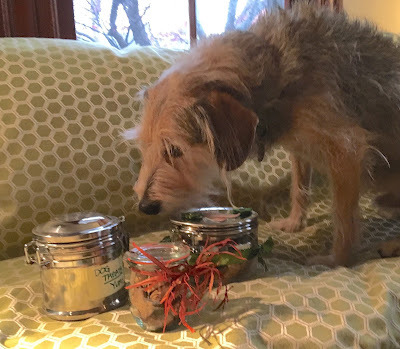 Here are the four different kinds of Natural Balance treats we received for sampling and filling our treat jars—from L-R: Limited Ingredient Treats® (LIT), Sweet Potato and Fish Formula; Mini Rewards, Duck Formula; Grain Free Dental Chews; and Belly Bites, Chicken and Legume Formula. 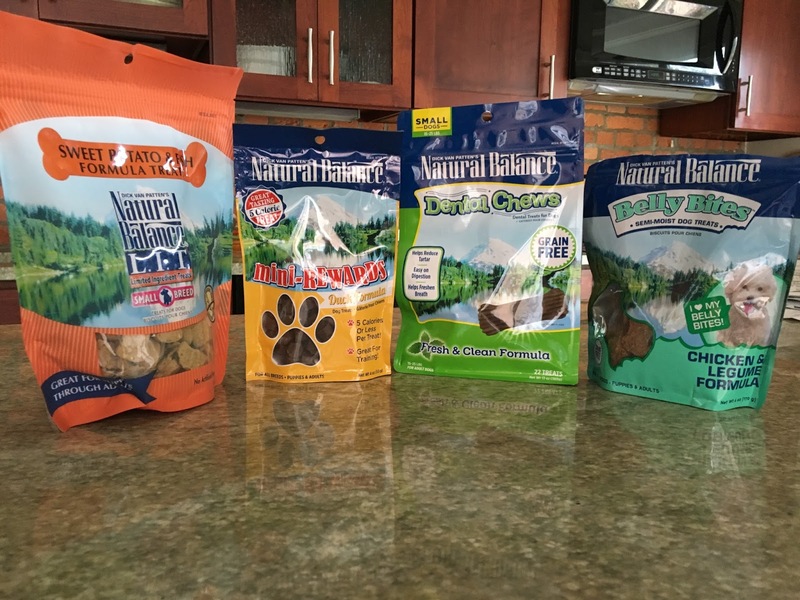 None of these treats contains artificial ingredients or colors, and the Dental Chews and the LIT are grain free. 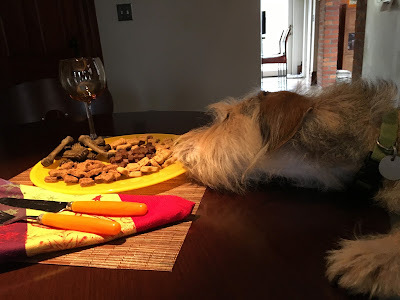 Parental Unit thinks these Natural Balance dog treats are worthy of their own place setting...and certainly worthy of, well, me and my distinct personality What a spread! 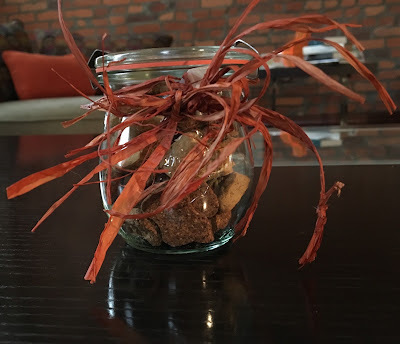 Before we get started with today's project, we wanted to share one very basic, DIY dog treat jar our good friend and Parental Unit's colleague put together for their shared office. Parental Unit brought in a container designed to hold ground coffee, and our friend added the label. Presto! A doggie treat container! 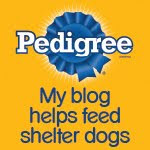 Since all dogs (including yours truly) were welcome visitors at our school, it was always well stocked. With the holidays coming up, it's always nice to bring a small hostess gift when you're invited to a party, or even better, give a small gift to everyone who comes over for say, Thanksgiving dinner. And we know all of your friends and family share their home with a pet, so healthy treats for their four-legged friends would be a welcome gift. 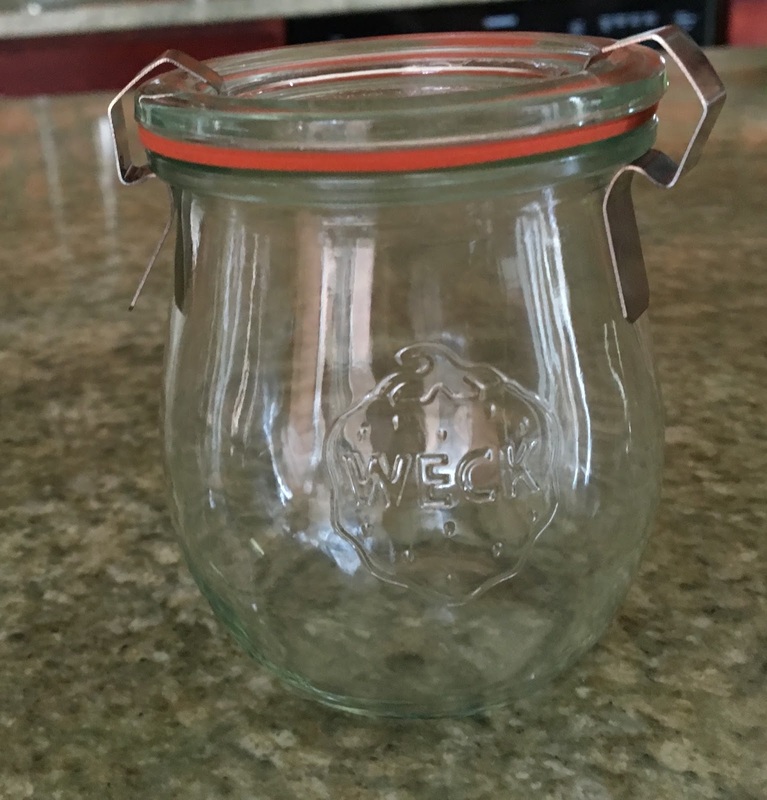 For this DYI project, Parental Unit really wanted to use this small glass jar that originally held fancy jam. We love its unique shape, and it's small enough to fit alongside each dinner place setting. 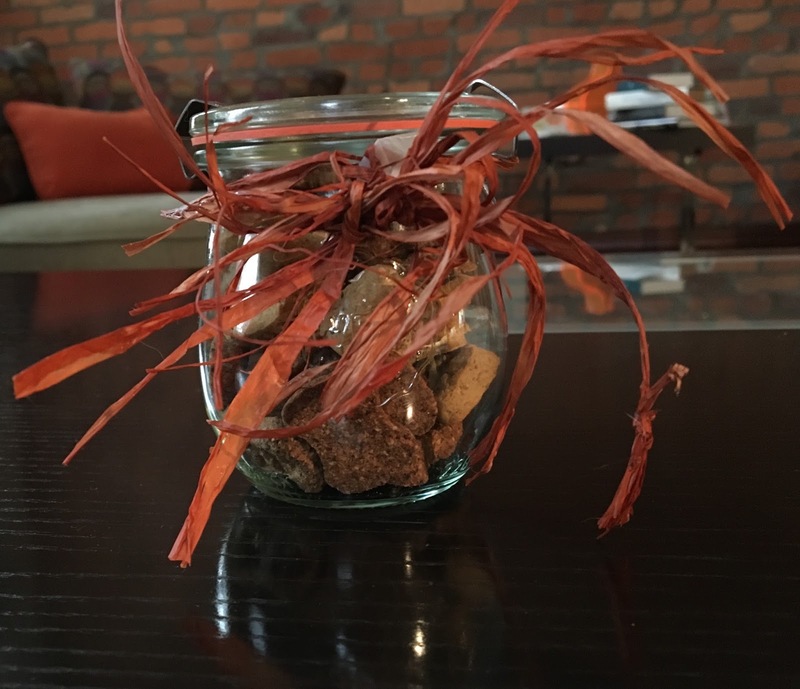 This jar already came with a pumpkin-colored seal, so we just added some rustic raffia ribbon for an autumnal look. You can tie a small card with each guests' name (or better, the name of their pet) to the ribbon. We mixed the chicken and legume Belly Bites and sweet potato and fish LIT treats for a colorful look. Since we also happened to have a larger container, Parental Unit and I dressed it up with a Christmas theme. And this time, I got my mug on it! Who wouldn't want a holiday gift with my face on it, I ask you? Parental Unit just cut out a picture of me from an old card and taped it to the top of the container. 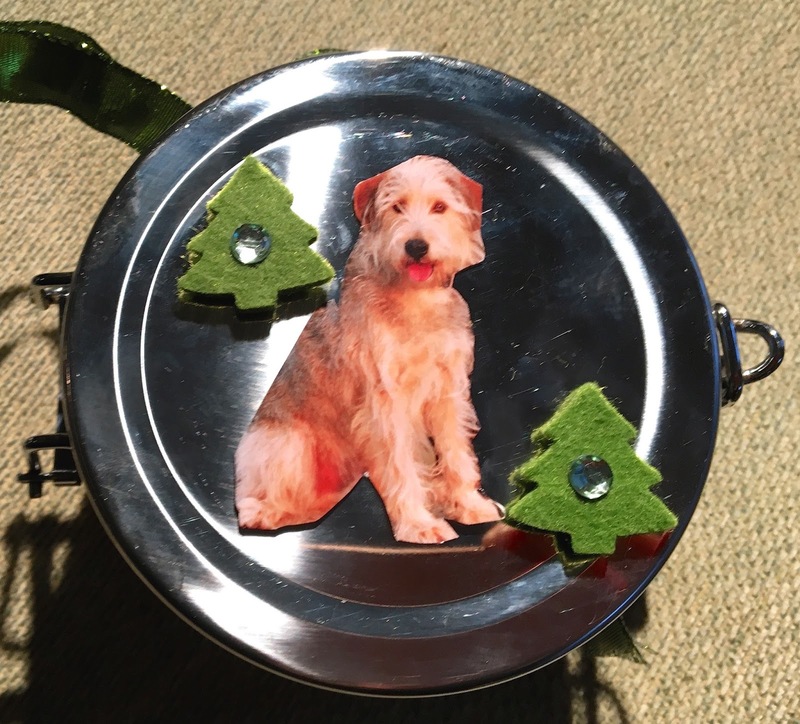 For a festive (but subdued) look, she added two tiny felt Christmas trees that she uses to top holiday presents (again, using regular scotch tape) and encircled the container with a matching, shiny ribbon. Ta-Dah! My holiday themed DIY dog treat jar filled to the brim with Natural Balance treats—the perfect, nutritious reward for all good doggies at holiday time. Do I get to sample a few of these healthy treats or is this all just for show? That's it? One, Mini Rewards, Duck Formula treat? This is an outrage! We'd love to hear about your DIY tips and see photos of your projects! I love DIY dog treat jars. I am planning on making some this Christmas! Great idea and yours turned our awesome. We are enjoying our treats too! Treat Jars are a great gift for the holidays!